Scaling up renewable energy access; government installed solar energy in Sumba island, Indonesia. Photo by Asia Development Bank/Flickr. Climate change poses a number of substantial equity challenges. The greatest threat from climate change is often faced by those who are the least responsible for creating the problem, frequently those already made vulnerable by poverty. Meanwhile, there are significant questions about who should combat climate change and how it should be done, from reducing emissions to making people more resilient to the impact of an altered climate. Since the inception of the UN Framework Convention on Climate Change (UNFCCC) more than two decades ago, issues of equity have been a major sticking point in negotiations. These concerns about equity must be addressed in order to build the necessary global consensus for a strong, ambitious and durable international climate agreement in 2015. But what is an equitable way of taking action in the context of growing emissions and climate impacts, from water scarcity and depressed agricultural yields to severe weather events? And how can we reduce emissions and build climate resilience while taking into account varying human development needs? 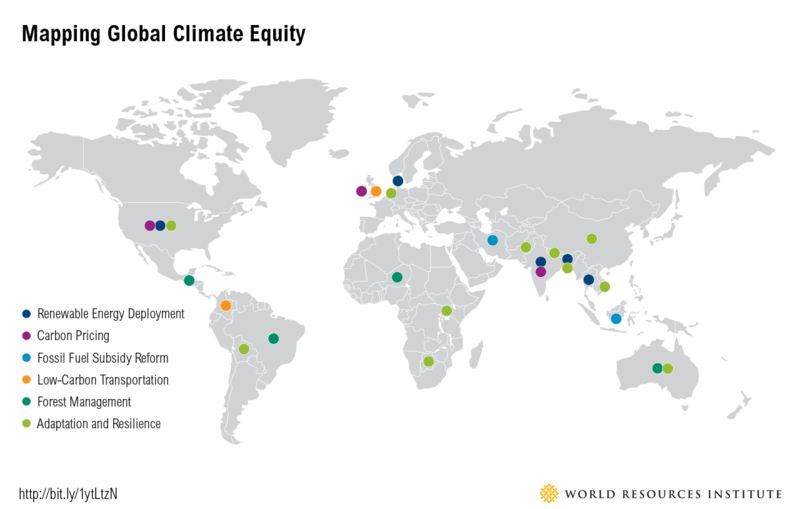 WRI’s report, Building Climate Equity: Creating a New Approach from the Ground Up, aims to provide a new perspective to address equity challenges, focusing on how climate action can strengthen peoples’ capabilities. Drawing on case studies from 23 countries, Building Climate Equity provides concrete examples of how climate action can improve peoples’ lives and enhance equity while tackling climate change – from increasing access to renewable energy and protecting community forest rights to preparing communities for climate impacts. The report describes this as a capabilities approach, focusing on how policies can simultaneously address climate change and improve peoples’ basic capabilities, such as their opportunity to have decent jobs, health, transport and physical safety and to engage in public decision-making. For instance, efforts in Indonesia to phase out fossil fuel subsidies have demonstrated significant benefits beyond mitigation. The money that had gone to subsidies was diverted to social improvement programs through cash transfers, increased access to health care and reduced school fees. Modeling suggests that the complete removal of subsidies could dramatically increase GDP and reduce poverty. If done right, international policies and institutions—including the 2015 climate agreement and the UNFCCC—can help foster these types of policies. The report identifies specific ways that the new climate agreement can shift the international equity debate and embed a focus on strengthening capabilities in future climate action. An increased focus on the broader capabilities of countries – such as development level, economic capacity and governance – can help achieve equity by enhancing the “respective capabilities” aspect of the UN Framework Convention’s principle of Common But Differentiated Responsibilities and Respective Capabilities. 1) Equity considerations, including capabilities, should be integrated in the process for countries to develop and evaluate other countries’ proposed commitments, known as intended nationally determined contributions (INDCs). 2) National actions proposed in countries’ INDCs also present one of the greatest opportunities to create synergies between climate action and capabilities. By incorporating climate actions such as energy, transport, and forest policies that build capabilities and climate resilience for the most vulnerable, countries can develop INDCs that enhance equity. For many developing countries, these policies will need to be supported by those countries with greater capabilities. 3) Equity should be recognized in all of the core elements of the 2015 agreement—mitigation, adaptation, loss and damage, finance, technology, capacity building and transparency and accountability. The role of capabilities should be considered in countries’ ability to act, while also creating ways to strengthen the well-being of people. For instance, a new capacity building facility could be created in order to assist countries in developing the national capabilities needed to pursue action. Similarly, the agreement should ensure that climate finance is used effectively to help build the capabilities of the least well off and most vulnerable. By focusing on what we have in common—the desire to achieve well-being and lead dignified lives—climate action and equity can go hand in hand.